Styx, America, and Michael McDonald have been announced as the headliners for the 2018 "'70s Rock & Romance Cruise." The luxury trip takes to the high seas through the Caribbean from March 3rd through March 8th, 2018. 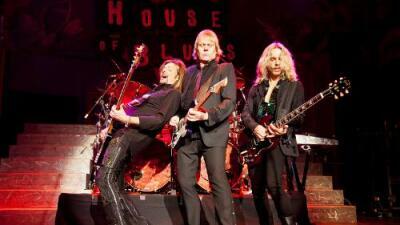 Along with Styx's special appearance on March 5th, other notable performers will be Air Supply, War, the Guess Who, B.J. Thomas, Atlanta Rhythm Section, Badfinger featuring Joey Molland, Poco, and others. The cruise departs from Ft. Lauderdale before hitting Falmouth, Jamaica and Georgetown, Grand Cayman. Styx guitarist J.Y. Young said of the cruise: "We are planning on having a heckuva good time and everyone coming should plan on the same." America's Dewey Bunnell added: "It’s very unique for us. We tour a lot, play lots of venues around the world but a cruise ship is a singularly unique experience. We get to be here with our fans, see you on the various decks, it’s great." Air Supply's Russell Hitchcock explained, "It really doesn’t get any bigger than this. The bands on this cruise have filled stadiums, topped the charts and launched thousands of love stories. It’s a spectacular, once-in-a-lifetime opportunity for the fans." According to the trip's official press release: "Throughout the voyage, guests will have the opportunity to attend special events that bring them up close and personal with the artists on board, including a wine and food pairing hosted by our top-rated sommelier, live game shows, behind the music Q&A's, panel discussions, pool parties, and unforgettable theme parties. All will take place aboard the luxurious Celebrity Summit, renowned for excellence in dining, deluxe cabins and stunning showrooms. Celebrity Cruises represent modern luxury in cruise lines, through sleek cruise ships and top-of-the-line amenities." Guitarist J.Y. Young told us that aside from Styx's greatest hits still receiving constant airplay, there's a relevancy in their song's lyrics that still connects with fans both old and young: "That music continues, and y'know, particularly Pieces Of Eight, like, 'Blue Collar Man.' Tommy (Shaw) was living in Michigan at the time he wrote that and it has such, unfortunately, such relevance today. So, some new music that wrote and created and popularized 35, 34 years ago fits perfectly, sadly, fits perfectly with what's going on in America today."